On Tuesday February 26, 2019 you made a huge difference! A small investment with big change. You can’t focus on schoolwork when the growl of your stomach is louder than the teacher’s voice. Without colouring pencils and paper, your homework goes unfinished. You’ll never be able to compete at the basketball regional tournament if you can’t get to the event. Children are falling behind in each and every day for reasons beyond their control. Without the basics, an education can seem impossible. For a child who lives in poverty in our city, $2 is the difference between nothing and something. It’s food on a plate or a notebook on a desk. It’s half the cost of a field trip to the museum: a price that seems low to most of us, but a barrier for so many in our community. Toonie Tuesday is all about experiencing small acts that can make a BIG difference. On the last Tuesday in February, students at participating schools are asked to bring $2 to help other kids just like them. All the funds raised from this day go directly to the Students in Crisis Emergency Fund. Your spare change will open doors for students who would otherwise be cut off from countless opportunities to succeed in education. In 2019 the Education Foundation of Ottawa’s Toonie Tuesday Fundraiser Raised more than $47,000! Want to get involved? It’s easy! 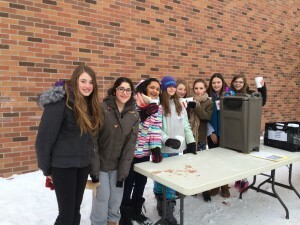 Students at Huntley Centennial PS serving hot chocolate for Toonies! Step 1 – Connect with the Education Foundation of Ottawa and let them know you want to participate. Step 2 – Request Toonie Tuesday materials to put up in your school and send home. Step 3 – Plan ahead for what is sure to be an exceptionally special day! Every $1 invested in the Education Foundation goes directly to support critical student needs.